Kudlow says U.S. Trade Representative Robert Lighthizer is "more optimistic than I've seen him in many moons." President Trump has repeatedly threatened to pull out of NAFTA if his administration cannot adjust the pact to better serve U.S. interests. White House economic advisor Larry Kudlow said Thursday that U.S. Trade Representative Robert Lighthizer is "getting close" to a trade deal with Mexico. Asked whether negotiations are nearing an end, Kudlow replied "Yes, yes. And our trade meeting with president – I don't want to give away any detailed secrets, but trade ambassador Lighthizer ... he's getting close. I think he was a little more optimistic than I've seen him in many moons." 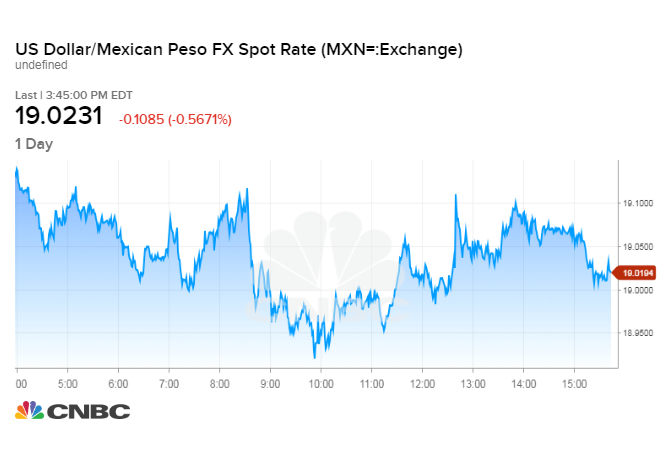 The Mexican peso rose immediately following Kudlow's comments, up 0.8 percent against the dollar at 18.96. Kudlow, who made his comments on CNBC's "Squawk Box," is director of the National Economic Council and one of President Donald Trump's top economic advisors. His comment come just days after Trump announced that the two nations were making progress on a trade deal. "Deal with Mexico is coming along nicely. Autoworkers and farmers must be taken care of or there will be no deal. New President of Mexico has been an absolute gentleman," Trump tweeted last Friday. "Canada must wait. Their Tariffs and Trade Barriers are far too high. Will tax cars if we can't make a deal!" he added. The U.S. and Mexico had been having bilateral discussions, and the U.S. said it could do separate deals with Mexico and Canada in trying to renegotiate the North American Free Trade Agreement. Trump has repeatedly threatened to pull out of NAFTA if his administration cannot adjust the pact to better serve his country's interests. Last month, however, Mexican and Canadian officials said they wanted to work toward a trilateral deal, and were not interested in bilateral agreements with the U.S.
Kudlow confirmed on Thursday that the U.S. and China will resume trade talks this month. The forthcoming talks comes amid hopes that a back-and-forth tariff battle between the two countries can be resolved. He also said the strong dollar is a "sign of confidence" in the United States.